When it comes to the lighting adorning the exterior of your home, a unique set of considerations comes into play. Proper outdoor home lighting can prove to be a safe, effective way of illuminating your beautiful property once the sun goes down. It’s important to complete your landscape lighting project properly to ensure a safe, cost-effective outcome for all parties involved. Those looking for a quality lighting company in Shelby can benefit from visiting our expansive location! The Shelby Design Center boasts a 20,000 square lighting showroom, built on 20 years of customer satisfaction. Our flooring and lighting store aims to supply Michigan residents with the best solutions in the industry. No matter what your home renovation plans are, our knowledgeable experts are here to help! Today, we’ll continue to look into modern lighting tips that may prove useful for your outdoor project. When you’re ready, be sure to stop by our showroom for the best service in the business! Providing lighting for this outdoor feature is essential for safely escorting your home’s inhabitants and guests onto and off of the property at night. When done correctly, path lighting successfully enables visitors to traverse the terrain quickly and safely. Proper lighting illuminates all dangers along the path, preventing trips and slips in the process. This area also requires lights to keep people safe from intruders, aggressive wildlife, and so on. The Shelby Design Center suggests utilizing downlights here to provide a soft glow, preventing glare while supplying proper light levels. The style that you choose for your deck can have a great effect on the finished product. There are many approaches a crafty homeowner can take in this endeavor, ranging from spotlights in nearby trees to cast an ambient glow over the patio to uplighting placed on the surface to highlight the ceiling or an umbrella. Going for a more romantic approach? You can utilize miniature lights under the steps and railings to create a scenic atmosphere that is sure to create wow your significant other. 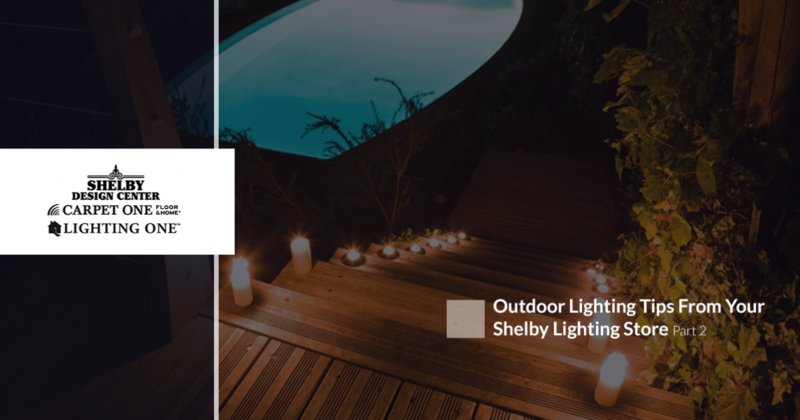 Generally, indirect lighting creates a perfect ambiance for any deck and patio. By illuminating the landscape features near your patio, you can effectively illuminate the space without glare. Proper light placement can make or break the entrances to your home. Generally, a soft light is recommended on each side of the entrance, or a simple fixture overhead will do the trick. It’s important to find an option that greets guests and inhabitants while ensuring overall safety. Lanterns or scones are both useful fixtures for creating a unique appearance. If you have an overhang in front of your door, the options become more numerous. Chain-hung, close-to-ceiling, and recessed light fixtures are all handy styles that can be customized to match the charm and appeal of your home’s exterior. As a general rule, it is recommended to find suitable lighting fixtures for any steps on your property for overall safety. There are multiple options to choose from, including styles for both the risers and treads on your steps. The Shelby Design Center has a variety of fixtures for your stairs, from recessed horizontal options to strip lights, wall lights, and more. As long as your steps are illuminated, the outcomes should be overwhelmingly positive. Many homeowners have taken on the task with zeal, matching their step lights with the rest of the fixtures on the property to create a more comprehensive theme. Outdoor lighting is perfect for highlighting the unique aspects of your property. Spotlights are a useful way of illuminating trees, rocks, and other features that can create an aesthetically pleasing display for your loved ones and guests. From landscaping to gazebos and pergolas, numerous aspects of your home’s exterior can benefit from appropriately placed lighting. Generally, you can graze or wash larger surfaces around your property. Wall grazing is done by placing a light very close to a surface (less than a foot) to highlight the textures and features of that surface. Wall washing consists of placing a fixture further away with the intention of creating a flat appearance. When used appropriately, both can result in a stunning appearance that is sure to amaze your guests. The location and method used to illuminate your property can create a dynamic display that is sure to wow anyone at your home once the sun sets. Creating a lighting plan and selectively placing your light fixtures can improve appearances as well as safety and security. Next time, we’ll discuss a few minor tips that can make a big difference for your outdoor lighting. 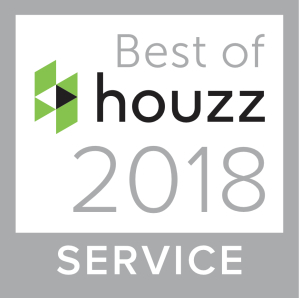 The Shelby Design Center is proud to be a quality lighting company for Shelby residents, offering expert advice and unique products for nearly every home renovation project. Stop by our lighting showroom to see our quality difference for yourself or contact us today to learn more!